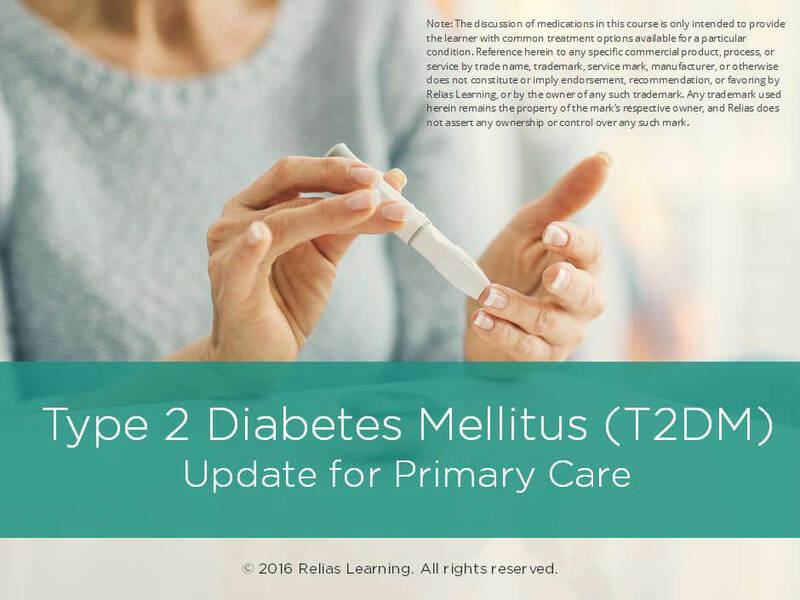 Type 2 Diabetes Mellitus (T2DM) is a progressive disease that is one of the most challenging health problems in the U.S. Medical management of T2DM requires a comprehensive understanding of the disease, treatments, and continuum of care. This course provides you with an updated review of the medical management of T2DM, focusing on medications and treatment strategies. The descriptive examples and interactive lessons within the training will prepare you to more effectively manage the individuals you serve with T2DM and teach them about their disease. This course is designed for clinical providers, especially those providing primary patient care. Providers should have basic to intermediate levels of experience in clinical practice. Describe two glycemic level targets based on professional practice guidelines for individuals with T2DM. Identify three oral anti-diabetes (OAD) medications. Explain one insulin initiation treatment strategy. Section 1: Introduction A. About This Course B. Learning Objectives Section 2: Diabetes Overview A. Meet Alicia B. Introduction C. What Is Diabetes? D. Types of Diabetes E. Check Your Knowledge F. Review of Basic Diabetes Terminology G. Review of Basic Diabetes Terminology, continued H. Glycemic Targets and Control I. Managing Diabetes: Normal Processing of Glucose J. More Terminology: T2DM Medical Management K. Terminology Review L. T2DM Management M. More about T2DM Management N. Self-Monitoring Blood Glucose (SMBG) O. A1c in Practice P. Summary Section 3: Pharmacologic Therapy for Type 2 Diabetes A. Biguanide (Metformin) B. Additional Treatment Options C. Quick Check D. Malcolm and Biguanide (Metformin) E. Mr. Guevarra and Glipizide F. Beatrice and Kidney Disease G. Check Your Knowledge H. Isabel Is Taking Sitagliptin I. Summary Section 4: Insulin Treatment for T2DM A. Insulin Treatment for T2DM B. Characteristics of Human Insulin and Analogs in T2DM C. Insulin Analogs D. Inhaled Insulin E. Quick Check F. Characteristics of Human Insulins and Analogs in Type 2 Diabetes G. Initiating Insulin Therapy H. Mr. Finn Is Starting Insulin I. Sliding Scale Insulin J. Summary Section 5: T2DM: Patient Management of Disease A. Components of the Initial Care Plan: The Individual with T2DM B. What You Should Teach C. Other Items to Address D. T2DM Teaching Checklist E. Quick Check F. The Diabetes-Cancer Link G. Integrating Cancer Risk Reduction into Diabetes Care H. What Patients Need to Know about Their T2DM Treatment I. Barriers to Adherence J. Bariatric Surgery in Type 2 Diabetes K. Meet Lorenzo L. Summary M. Alicia Returns: What to Do Now? Section 6: Conclusion A. Summary B. Course Contributors C. Resources D. References E. Congratulations! Terry Gregoire, BSN, RN, NCSN currently works as a Public Health Nurse in the school system. Terry has 3 years Pediatric ICU experience and 8 years hospital experience in adult and pediatric units. She is Board Certified in School Nursing. She enjoys her role as staff health educator and school nurse at Forest Park Elementary and has been a school nurse for 5 years. Terry fills in during the summer months working in Communicable Disease/Immunizations of her Public Health Department. Disclosure: Terry Gregoire, RN, BSN, PHN II, NCSN has declared that no conflict of interest, Relevant Financial Relationship or Relevant Non-Financial Relationship exists. The target audience for this course is: entry and intermediate level Nurses; in the following settings: Health and Human Services.